One of the things I love to do is make a salad with leftovers. Sometimes I even plan my meals to create salad friendly leftovers. 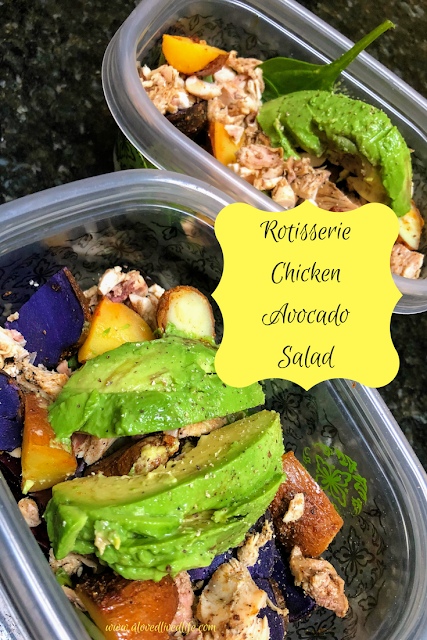 Here's a quick and easy salad recipe to use up some leftover rotisserie chicken and roasted potatoes. Throw some greens in a bowl or container. Chop up the chicken and veg and put it on top. Grind some salt and pepper over the top. You're ready to go. We didn't use any dressing, but a balsamic vinegar would be a tasty addition. Looks yummy, but that looks like a lot of avocado!